The New Haven Register Blogs: Ramblings from The Runway: What? Duke had a losing record last year? Did you know Duke went 0-12 last season and has lost 20 straight games? Figured at least the 0-12 part was fairly common knowledge. But talking to a bevy of UConn football players today, you might as well have asked them if they knew what Sonny Jurgensen's quarterback rating was from his days at Duke in the 1950s. Gray seemed sincere, and there's no reason to doubt he had no idea of Duke's recent misfortunes. But I don't think everyone was being completely up front about it. Then again, I do believe Randy Edsall when he says the streak hasn't been talked about at all by the UConn coaches. And really, there's no reason to bother discussing it. Randy Edsall wants his team to treat every game as a must-win situation. For the Huskies, games with Duke, along with Temple and Maine, are absolute must-win situations. More than any Big East game. Could there be a bigger blow than losing to a team in the dregs of Division I-A football (or a I-AA team)? For a team in a tenuous situation like UConn, the answer is a resounding no. Duke hasn't won in 20 games. Haven't beaten a I-A team in the last 23 (the last win was against I-AA VMI in 2005). To the players, that doesn't need to be discussed. It's about their own preparation and grasp of the game plan. If they execute well, they'll at least be in a position to win. Zak Penwell was awarded a full athletic scholarship last week. No more paying to eat at the team training table. He's received plenty of media attention already, but on Wednesday he has a phone interview with his hometown paper, the Fairbanks (Alaska) Daily News. Randy Edsall continues to be vague regarding Ryan Henegan's status. "He's day-to-day" was his answer to whether Henegan will play against Duke as well as his answer to whether Henegan will even practice this week. I took a walk up to the practice fields at 3 p.m. to see for myself during the 45-second open window for media. Henegan does look better. He was in full pads with a less ominous knee brace, and even jogged through some of the warm-up drills and sprints. Still, he's walking gingerly. If the game was today, he wouldn't play at all. Tony Ciaravino may be the top field goal kicker on the team, but he's a distant second in the punting department. The Heat Miser was booming his punts in practice today. Quite impressive. I enjoyed the "Blazin' Redfish" that was part of the menu for the media this afternoon. Breaded fish kicked up a notch with some cajun seasoning and spices. Well done. 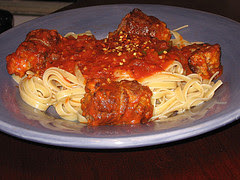 Now if they can just learn to cook up a decent pot of sauce for the spaghetti, simmering with some meatballs and sausage (maybe even a little bracciole), all would be perfect. Call me. I have recipes. Duke coach Ted Roof had this to say regarding suspended linebacker Michael Tauiliili, “No one player is bigger than the program. He made a mistake and embarrassed himself and the program. That cost him the chance to play in this game. We’re obligated to do what’s right for the university, the athletic department, the football program and for him (Tauiliili)."